Coconut oil is used extensively in tropical countries especially India, Sri Lanka, Thailand, Philippines etc., which have a good production of coconut oil. At one time, the oil was also popular in western countries like the United States and Canada, but there was a strong propaganda campaign in the 1970s spread by the corn oil and soy oil industry against coconut oil. Coconut oil was considered harmful for the human body due to its high saturated fat content until the last decade (2000s) when people began to question the claims of the propaganda. Next, lets look into some more details of how coconut oil works in our body. 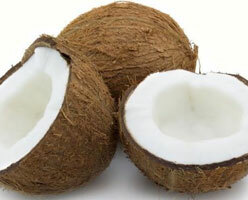 More than ninety percent of coconut oil consists of saturated fats (Dont panic! Its not as bad as it sounds, read to the end of this review and your opinion may change), along with traces of few unsaturated fatty acids, such as monounsaturated fatty acids and polyunsaturated fatty acids. Virgin coconut oil is no different from this. Saturated fatty acids: Most of them are medium chain triglycerides, which are supposed to assimilate well in the bodys systems. Lauric acid is the chief contributor, representing more than forty percent of the total, followed by capric acid, caprylic acid, myristic acid and palmitic.